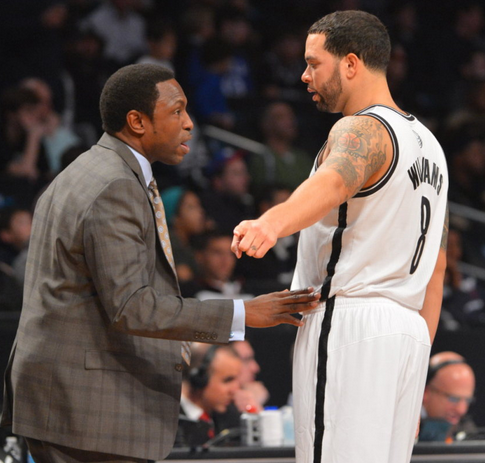 Did Avery Johnson deserve to get axed by the Nets? The big news of the NBA today without a doubt was the news that the struggling Brooklyn Nets, sitting at 14-14 and in eighth place in the Eastern Conference after having lost five of six, had fired coach Avery Johnson. Did the "Little General" deserve to be fired or was something else at play? In case you have not noticed, the NBA has become a players' league, if not a stars' league, and thus if your key players are not healthy, the coach is going to have to go, especially considering it is much easier to get rid of your coach than it is to get rid of your players. It had become clear that the Nets, particularly star point Deron Williams, had issues with Johnson, who has had a history during his coaching tenures in Dallas and with the Nets that he is difficult to work with, and has had plenty of issues with his point guards, which is an issue with a player as prickly as Williams. And it has been apparent that Johnson's slow, at times plodding, style of offense was not a good fit for this club as shown by the fact that the team has a very efficient offense that has not scored a lot of points, plus they have been atrocious on defense, as expected. With the club disappointing thus far after coming in with high expectations, and especially as their crosstown rivals New York Knicks have been off to a surprisingly strong start, it really should not be surprising that Johnson got the ax. But all of that aside, this is not to say that Johnson is completely at fault for what has gone on in Brooklyn, it was not long ago that he was Coach of the Month for October/November. Owner Mikhail Prokhorov and general manager Billy King are at fault for putting together the roster and leading to higher expectations than what was probably deserved as this club finally moved to Brooklyn and open up the Barclays Center. This roster, which is incredibly hard to tinker with considering the huge contracts on the payroll, should be able to fix itself on offense but the defensive problems are a real problem which is a result of the front office's moves. And much of the blame does have to go to the players, and in particular the aforementioned Williams, who is having the worst season of his career save for his rookie campaign. The clear discontent with Johnson only goes so far as an excuse as Williams, who is the face of the franchise and he signed a max contract with the club in the offseason after the team made the moves they deemed necessary to keep him in the fold. Since he is the fact of the team, he has to set the example for the rest of the players and it is clear that he has not done so this year. Williams also has to improve his attitude because he has had problems with both of his head coaches in his career and could be developing a reputation as a "coach killer" as both coaches he has played for have had leave the team because of said problems. As for who will be the long-term replacement for Johnson? The team is apparently setting their sights on the pipe dreams of all pipe dreams: Phil Jackson. Two words: not happening. A more realistic replacement who would fit the high-profile desired by the organization would be Stan Van Gundy, who has been doing some work for NBC Sports after getting fired by the Orlando Magic, and while one could only think what could happen if he and Williams do not mix, I do think he would take the job and would be a very good hire. Larry Brown's name has been floated due to the fact that he has worked with King before but do they really want to have a go with the 72-year old who has had only one winning season since 2005 and would he bail on SMU that quickly? Nate McMillan and Mike Brown could also be contenders, but would they fit an organization that looks for headlines and attention? Now all is not lost for the Nets this season, even as they will be coached in the interim by P.J. Carlesimo, a man who has earned a reputation as a truly awful NBA coach. After all, it was about a month ago that this team was 11-4 and in second in the East. And the Nets are only two games from being the fourth seed in the conference. It is possible that they could get their act together and make a solid playoff run the rest of the season, but it is also possible that they continue their downward slide and miss the playoffs altogether. That is up to the players to decide as Johnson is no longer in the mix.